or, Fbuoy = Vρg where V is the volume of fluid displaced, ρ is the density of the fluid and g is the acceleration due to gravity. 3. Equation of continuity in fluid dynamics, as applied to liquids which are supposed to be incompressible, is A1v1= A2v2 where A1 and A2 are the cross section areas of the tube and v1 and v2 are the velocities of the liquid at these sections respectively. P + ρgh + (½)ρv2 = constant where P is the pressure, ρ is the density, ‘h’ is the height (with respect to the reference level for estimating the gravitational potential energy) and ‘v’ is the velocity of the fluid. The symbol ‘y’ also may be used in place of ‘h’. 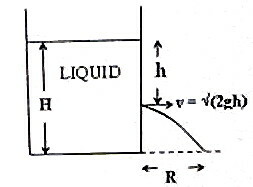 In the case of a liquid flowing through a horizontal pipe (constant gravitational potential energy), the pressure of liquid will be smaller at points where the velocity is greater and vice versa. where ‘h’ is the depth of the hole (fig). where P is the atmospheric pressure. Note that the hole is open to the atmosphere, as is the free liquid surface in the tank. Note that the above expression is obtained by considering the horizontal range (on the ground) of a particle projected horizontally from a height (H–h). Do it as an exercise. The range R will be maximum if h = H/2. [You may show this by putting dR/dh = 0 when R is maximum]. The maximum range is H.
In the next post we will consider some typical questions in this section. Of course, their solution also will be discussed.